Quick and easy, light and tasty, this dish is perfect for lunch or when you are on the move. Preheat the oven to 190C/375F/Gas Mark 5. Roll out the puff pastry on a lightly floured work surface. Cut the pastry into 4 discs (approximately 4 inches in width). Retain any remaining pastry in the fridge for later use. Lay the small discs onto a flat baking tray and place another flat baking tray on top of them to prevent the discs from rising up. Place in the oven for approximately 20 minutes until the pastry comes out golden brown. Allow to cool down and then spread lightly with the green pesto. Scatter the sun dried tomatoes over the pastry. Using a sharp knife peel and trim the asparagus and distribute that over the top of the pastry also, placing three asparagus spears on each. 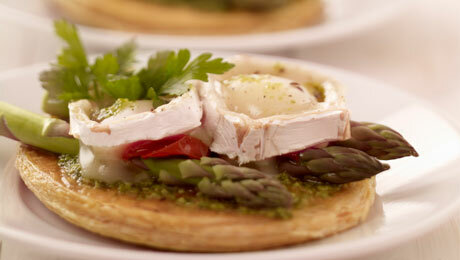 Using a sharp knife slice the goat’s cheese into pieces, and place 2 thin slices on top of each tart. Place the tart in the preheated oven for 10-12 minutes and heat until the cheese has melted and bubbled.